At Fork Truck Direct, we are known across Suffolk and Essex for our comprehensive range of gas forklifts for sale, as well as for our gas forklifts for hire. Our total fleet includes over 300 forklifts, so we are capable of meeting even the highest demands. 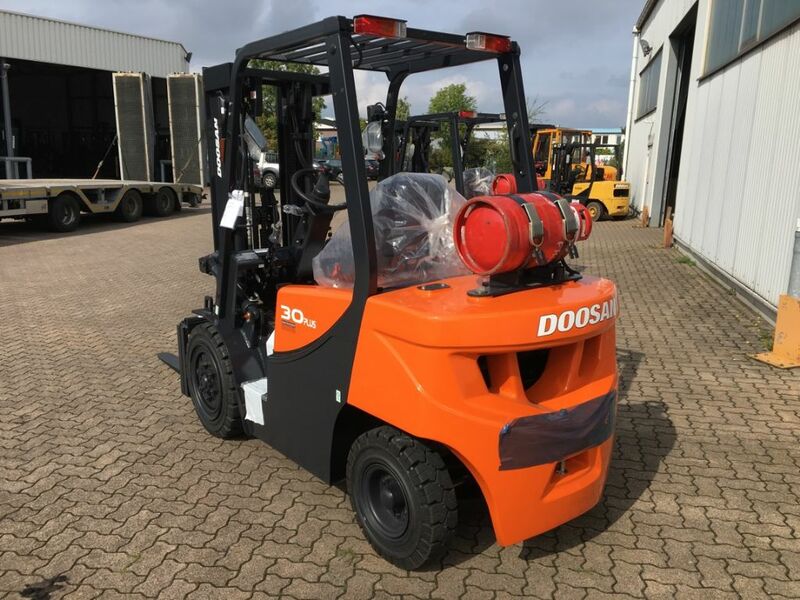 If you are looking to rent a gas forklift, or buy gas forklifts, we have a wide selection of Doosan counterbalance gas trucks available which range in capacity from 1.5 to 16 tonnes. These Doosan gas forklifts are designed to be rugged, reliable and simple, which makes them the perfect machine for many businesses across the UK, and globally. The forklifts feature everything from oil-cooled disc brakes to integrated side shifts and a variety of important safety features. When it comes to hire gas forklift or buy gas forklifts, you need machines which you can rely on. We are able to hire machines for as little as one day all the way to six years. Our short-term hire solutions are ideal for companies which need a reliable machine for a short period of time. Our short-term contracts are available for as little as one day to as long as one year, to give you as much flexibility as possible. This type of hire will allow you to meet peaks in demand without having to bear the burden of a large machinery investment, whilst benefiting from a reliable and safe machine. If you are looking to rent gas forklifts over a long-term period, we offer our machines for contract hire on rental periods of up to six years. Hiring a forklift can allow many companies to benefit from the reliability of a new machine, without the large upfront cost. We also offer a range of fully refurbished forklifts for those looking to reduce costs whilst still having a reliable machine. We know how important it is to budget, which is why we offer a fixed maintenance cost on all of the machines we have for hire. So, should you be hit with a sudden repair, there is no need to bear the cost, making it simple for you to budget for the hire period. For your peace of mind, we are pleased to report that our forklifts are known for their productivity with an uptime of 97%. If you are looking to hire gas forklifts within the Suffolk or Essex area, we are known for our low transport costs and quick delivery times. All of our forklifts are available for delivery within 24-48 hours and the costs of transport are low because we have our own transporter vehicles. We always strive to find new ways to lower your operational costs, whatever hire arrangement you are looking for. For a gas forklift which fits with your business, contact our team today, who will be happy to advise you.